(Ottawa, Ont.) 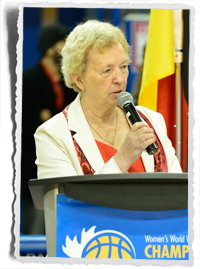 Wheelchair Basketball Canada congratulates International Wheelchair Basketball Federation (IWBF) Secretary General Maureen Orchard of Winnipeg, Man., on the announcement of her induction into the Manitoba Basketball Hall of Fame. Orchard joins the Class of 2015 in the builder category with an official ceremony scheduled for Saturday, October 3, 2015 at the Victoria Inn Hotel in Winnipeg. Wheelchair basketball is amongst the most popular sports in the world for persons with disabilities and Orchard has been a driving force in the ongoing advancement and prosperity of the game worldwide. Through her tireless efforts she has helped realize consistent growth in the number of teams and participants who play the sport from grassroots to high performance. Most recently Orchard served as president of the IWBF from 2002-2014, where she championed ongoing development of wheelchair basketball across all four international zones. Amongst her accomplishments, Orchard helped establish enhanced opportunities for junior athletes and women including the introduction of the inaugural U25 Women’s World Wheelchair Basketball Championship in 2011. Prior to her retirement in 2014 the IWBF held the two largest World Championships in their history, which due to the expansion of participating teams saw the women’s competition held separately from the men’s for the first time in 20 years. “Maureen is very much a trailblazer who is most deserving of this honour. She is an internationally recognized leader, who is best known for her passion and ongoing dedication to the growth of basketball and wheelchair basketball around the world. Her unparalleled contributions to wheelchair basketball in particular remain a source of pride and inspiration to all Canadians,” said Wheelchair Basketball Canada Executive Director Wendy Gittens. Orchard also served as president of the Canadian Wheelchair Basketball Association (CWBA) – now Wheelchair Basketball Canada – from 1993 to 1998. She was inducted into the CWBA Hall of Fame as a builder in 1998. As a lifelong volunteer, Orchard has taken on many leadership roles within the basketball community, serving as president, vice-president, treasurer, director, coach and referee for a number of key sport organizations, including the Canadian Wheelchair Sports Association, the CWBA, the Canadian Paralympic Committee, Canada Basketball, Basketball Manitoba, and FIBA.